Bumblebee Creation's unique Cartoon Family photo mounts make the perfect gift for any household. 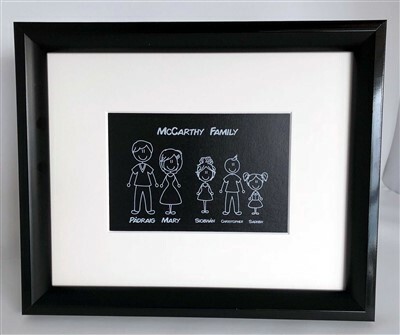 Our photo mounts fit into a standard 10x8 inch photo frame (not included), we recommend black to compliment the white text on black background. You can select up to 7 family members (larger families coming soon). In the Family Member box enter their Name and age (for children), starting with the oldest family member. Use one box for each family member. If the adults are grandparents, please state this beside their name. Children of 18 years and older will be represented as an adult. Grandparents will be shown as Mature Male/Female unless Adult Male/Female is requested. Adult Male/Female: persons 18 and over. Please let us know if you require any height adjustments if more than 2 family members fall within the same age category. Above the family members you can have the family name or simply Our Family.